Russia’s major political mystery that has been puzzling people for the past four years is finally solved: Medvedev does not plan to run for a second term. At a Saturday convention of the United Russia party that dominates the Russian parliament and leads the pre-election opinion polls, President Medvedev suggested that the party supports Vladimir Putin’s candidacy at next year’s presidential elections. The announcement was made less than six months prior to the vote, which is scheduled for March 4 next year. “I believe its is only right for the convention to support the party chairman Vladimir Putin as the presidential candidate,” the president said speaking at the United Russia convention in Moscow. The initiative was met with a wave of applause. “This applause gives me the right to refrain from explaining what great experience and authority Vladimir Putin has,” Dmitry Medvedev continued. “We, Vladimir Putin and I were sometimes asked, ‘Haven’t you quarreled?’ I’d like to confirm what has been just said. What we propose to the convention is a well-thought decision and even more,” he stressed. Minutes before, this Putin told the party convention that he suggested Medvedev be placed on top of the list for the December parliamentary elections. Medvedev said that he agreed to this and expressed readiness to head the Russian government if United Russia wins the most seats in the parliament, which is an extremely likely scenario. Hardly a single media conference has passed since Medvedev – Vladimir Putin’s protégé – took office in 2008 without journalists asking which of the two leaders would compete for the top job in 2012. While ordinary citizens remained happy in blissful ignorance, analysts and the media kept speculating and searching for hidden signs hinting at a possible answer. However, up until now both the president and the prime minister have remained enigmatic, feeding journalists promises that they would reveal everything when they “make a decision”, or when “the time comes”, or “soon”. 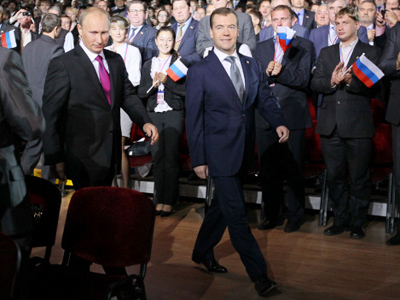 At the same time, neither Putin nor Medvedev had ruled out the possibility of seeking the presidential post again. Nonetheless, on a few occasions the “tandem” made it clear that they would not “elbow each other” or turn from political partners into political competitors. "When I see fit to say whether I will or not, I will do so," he pointed out. "Not very much time is left to wait. Each story should have its intrigue, otherwise life would be dull." Based on the tenor of Medvedev’s previous speeches, it is more-or-less clear what his candidacy program might focus on during the parliamentary campaign. At the very beginning of his term in office, Medvedev announced war on corruption as one of the top priorities. The modernization of Russia’s economy is another top goal, which also includes the improvement of the investment climate in the country and the development of innovative technology. In his opening speech at the St. Petersburg Economic Forum, Medvedev suggested a five-step plan that would speed-up the process of the modernization. First and foremost, Russia needs to go on with the privatization of state property, he said. The third step is the improvement of the court system, which is followed by the fight against corruption. Crowning the list is the creation of a world financial center in Moscow. For this purpose, Medvedev reiterated, Russia is in talks with the EU about a visa-free regime. The authorities would also soon cancel restrictions for the placement and circulation of Russian capital assets abroad. The president also promised “many important amendments to the legislation” in 2011. After Medvedev voiced his support for Putin as Russian President on Saturday he briefly repeated all major points of the "modernization" program and said that they must become United Russia's priority for the parliamentary poll.